Strange, life-size toy soldiers, armed with real weapons, have started appearing all over Gotham. When Batman investigates, however, he discovers that they are not toys, but people trapped inside explosive shells ranging from Tobias Whale‘s hit squad operative Joseph “Ice Pick Joe” Crimple, Whale’s financial adviser Donavan Baker, and District Attorney Marion Grange. The clues lead him to a former mob accountant named Humphrey Dumpler (AKA Humpty Dumpty) who went insane when Whale tried to silence him before he could testify against him. 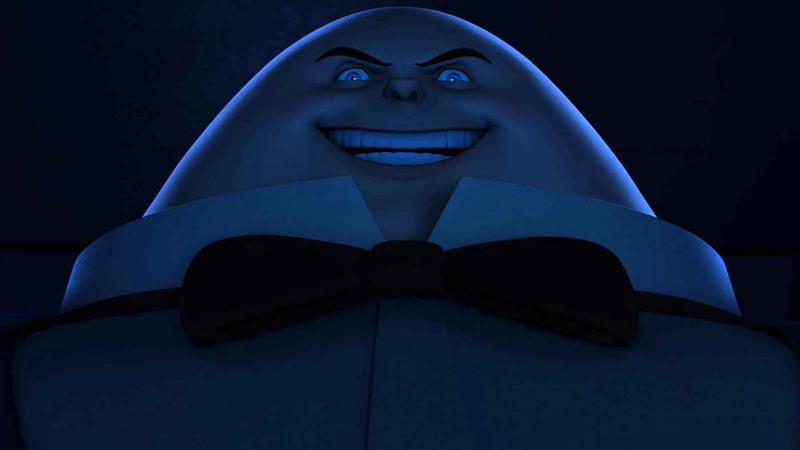 Now, Dumpty wants payback and one of the people he’s targeted is Lt. James Gordon. The episode begins with Katana looking for the Soul Taker sword which Silver Monkey was searching for in the previous episode, as it appears to have disappeared. Meanwhile toy soldiers are popping up all over Gotham with people inside them. Gordon attempts to take the people out but Batman stops him revealing that if they attempt to take the people out of the soldier then they will blow up. Soon with the help of Gordon, Batman discovers that the man behind the attacks is Humphrey Dumpler, former mob accountant. Dumpler’s breakdown has sent him over the edge and he now wants to kill as many people involved in his accident as possible. After kidnapping Tobias Whale, Dumpler goes after Gordon. In between the main plot we get a sub plot centring on Katana and Alfred. After discovering that Alfred has the Soul Taker sword we learn more about the mysterious weapon. This section is really only there to develop the arc but even so they do develop the characters of Katana and Alfred. We see that to Katana Alfred is a father figure and that Alfred treats her in a similar way. This helps give the characters more depth and makes us care about them more. Back to the main plot and Batman catches up with Dumpler. After he rescues Gordon and Whale, Batman goes to confront the psychotic Dumpler. The odd thing about Batman in this episode is that he refers to Dumpler as “Humpty Dumpty” even though he said that Dumpler never calls himself that. Does Batman feel he has to call everyone he meets by a villainous name? Like the odd mugger he must fight during his never ending war on crime, does he call him “Evil Mick Robby Pants”? Batman catches up with Dumpler and pleads with him to come with Batman to some form of hospital where they can help him. However, after a fake Dumpler falls to its “death” it is revealed that he has got away. This episode returns once again to the crime solving part of Beware The Batman which was sadly missed in the last episode. Aside from Batman’s weird fixation on giving his enemies’ villainous names, the episode is very good with all the hints being logical and it is quite easy to see Batman’s reasoning as to how he finds out that Dumpler is the mastermind behind it all. All in all, Broken is a fantastic episode and one I would highly recommend.